One bad thing about electronics: they need power. 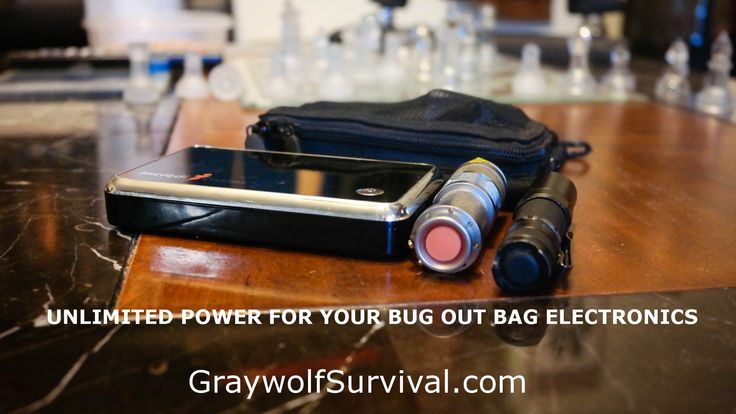 Things that supply power take up weight and space in your bug out bag. By choosing wisely, you can cut down on the size and weight of your power system and still have almost unlimited power. Not like Thor-unlimited power, but still. The more electronics you carry, the more spare batteries you’re going to need if you want to run them for extended periods. By cutting down on the variety of batteries, however, you can reduce the overall weight and size of your bag. By making sure your components work well together, you can ensure you can have power in a variety of circumstances. //UPDATE – I’ve since updated this system but I don’t have a thorough article explaining it like this one does but if you’d like to see what I’m carrying now, check out How to build the ultimate 25 pound bug out bag. Several years ago, my go bag had several different flashlights and gizmos that all took different size batteries. Most of them came in the CR123a flavor because I got a lot of it for deployments downrange over the years, and the CR123a is a great battery. The CR123a battery is used a lot in photography and in military optics and lighting. It packs a powerful punch and doesn’t take up a lot of room. It was my primary battery for a long time. If you do a lot of work downrange, you may want to stay with a CR123a for all your electronics – there are ways to do pretty much the same thing I did here but a bit more expensively. If you’re a typical prepper, you should consider switching to AA batteries. When I started really looking at my bug out list and trying to find ways to cut down on inventory, I started realizing that I had to keep spares of a lot of different batteries to make sure I always had a backup. Most of my issued equipment and things I bought in the various PX’s in Iraq and Afghanistan came in CR123a, a few things from home were AA and AAA and a couple odd headlamp or other lights were CR2032 or even smaller. I had a pocket I filled with nothing but batteries. At one time, I had five different sizes. Keeping two spares for each meant 10 batteries. I’d rarely ever run out so at most I’d use up 2 of those before I got back to where I could easily get more. Then one day, I ran out of power for one of my lights while I was in the Bahamas and I didn’t have anywhere I could buy that size. Now I was stuck with a dead light and a pocketful of useless batteries. Granted, I did have backup lights I could use, but I was still carrying extra weight from a light I couldn’t use and spare batteries from the other lights I didn’t end up using. Not only is that extra space and weight, if I would have stayed there longer, I would have eventually run out of power with all my flashlights unless I left the island to go get more. By carrying 5 battery sizes, I had to keep spares of each size. If I ran out of power for something, I only had the two spares for that and another 10 that I didn’t need at that time. If I could swap everything out for just one size though, I could cut down from having 12 batteries to maybe 2-4. No matter which gizmo ran out of power, I’d have spares for it. Then I thought, what happens if I’m in a long-term scenario such as an extended survival situation or if SHTF? What would I do for batteries then? CR123a batteries are great, but you won’t find them everywhere. I decided I was going to switch everything to AA, but only if I could make it work. Why AA? Because every single freaking house in the United States has AA batteries. More AA batteries are sold than all other battery sizes combined. In addition, and just as important, rechargeable AA batteries and chargers are relatively inexpensive. If I worked it out right, I could have an almost unlimited supply of batteries for only a slight increase in size and weight, if any at all. Other than the fact that eventually, rechargeable batteries won’t take a charge anymore, I’ve pretty much done it. A portable USB backup battery. A backup sCharger-5 solar panel. A Kindle Paperwhite to back up my documents and hold my survival and reference books. My iPhone and iPad most of the time. One of the key things in this whole setup is the AA batteries. You may not know this but batteries aren’t all the same. If you’re looking to run things in an emergency, do yourself a favor and spend the extra money on good batteries. I chose Lenmar because I haven’t found anything better but Eneloops are extremely good batteries too. Make sure you get something at least 1,700mAh. The mAh (milli-Amp/hour) is how long the battery will last when charged. Theoretically, it’s how many hours it will put out a milliamp of current. A thousand milliamps makes one amp. There are a lot of 700mAh-850mAh batteries out there cheaper but that means that you’ll either have to charge them more often or carry more of them. I chose the Lenmar 2700mAh AA batteries because they’re 2,700mAh. Both these flashlights take AA batteries. The Fenix LD-10 flashlight is a super small light that lasts for quite a long time. It’s great for most times that you need a flashlight, but it isn’t super bright. In most cases, you won’t need a bright light, and in some cases such as man-tracking or search and rescue, you can’t use a bright light because it washes out the ground in front of you so you can’t see the imprints. The Mini Cree Led flashlight is a fantastic light for under $5. light though is SUPER bright. It’s like a mini spotlight that you can keep in your pocket and has a lens that you can focus. Obviously, this one won’t last as long as the LD-10 but you won’t have any problem lighting up a room with it. It also takes a single AA battery. I reviewed this light and I think it’s – Best EDC flashlight for the money, and one of the best values of pretty much any prepper gear. A lot of my readers have bought literally dozens of these to give as gifts, put in each vehicle, and keep around the house (and I keep buying one or three every time I order something). They do take a few weeks to come in though. To use A/C wall power to run the battery charger or charge my USB battery, I use an adapter. My current adapter just fried so I’m ordering a PowerGen 2.4-Amp Dual USB wall charger . It’s a little bigger but it can handle a lot more power. I should have done that the first time. I have the stock iPhone/iPad charger in the pic for reference but I need that one to charge my phone at night when I’m at home. Inside the Goal Zero Guide 10 Plus Solar Recharging Kit is a solar panel and a AA battery charger pack. The huge difference between this charger and almost every other battery charger on the market is that it can charge with a USB input. This is critical to the overall plan. This pack has a built-in light that actually comes in pretty handy as another backup in case you need it. It runs off the AA batteries in the pack that you’re charging. ALSO, it has a USB output. Once you’ve charged the batteries to a decent amount, this pack can be used to run USB accessories like an LED stick light . If you just want the Goal Zero battery charger pack by itself , you can buy it separately. If you do happen to have AAA instead, you can always just get some inexpensive AAA to AA Converter Adapters and charge AAA batteries with this charger. You can also get AA to D adapters if you want to run things like lanterns off AA batteries but obviously they won’t run as long that way (that pesky mAh thing again). The Goal Zero kit has a foldable solar panel that can charge the AA battery charger. It’s strong enough that it’ll charge my iPad or iPhone in direct sunlight. Unfortunately these will both stop charging if a cloud comes overhead and won’t kick back onto charging when the sun comes back. It’s a common problem with any portable panel anywhere near this size. In addition, I also have an sCharger-5 solar panel that I carried in Afghanistan. It’s a pretty sturdy unit and will charge my iPhone, iPad, Kindle, or Goal Zero battery pack just like the Goal Zero solar panel will. I haven’t done any real testing of this vs the GZ one but I suspect it’s just a tad stronger. I try to keep one panel in my go bag and one in my main bug out bag. To solve the problem of not always having daylight and the cutting-out of charging the iPand and iPhone when clouds come, I use the USB battery. It will charge whether it’s getting a small current from a cloudy day or a larger current from a sunny day and doesn’t stop charging like some electronics does once it drops down to a certain point (at least as far as I can tell). As with the AA batteries, the mAh’s are important. You need to get as many mAh’s as you can while still keeping the size manageable. I still use the Incredicharge I-11000 USB battery that I brought to Afghanistan, which was the best one I could find a couple years ago. It’s 11,000 mAh, which has been fine for me. They don’t have that available the last time I checked but the Anker® Astro E5 15000mAh USB battery has a bit more power and is cheaper anyway. The flashlights take AA batteries, which are charged in the battery charger pack. One light is super bright and the other will last a long time on a single battery. AA batteries can be found pretty much anywhere. The charger pack can be charged by solar, AC (with the adapter), a USB computer plug, or the USB battery. The charger pack has a built-in light, and so does the 24,000 mAh USB battery if you get that one. The AA charger pack can put out USB power, which can also charge my iPhone, iPad, or Kindle. The USB backup battery can charge my iPhone, iPad, Kindle, or AA charger pack. The A/C-USB plug adapter can run the AA battery charger and/or charge my USB battery, iPhone, iPad, Kindle. So basically, I can just store four rechargeable AA batteries in the charger, and four spare batteries in a pocket, plus one each in the flashlights. With this setup, it doesn’t matter if I have A/C power, sunlight, sketchy sunlight, or need power in the middle of the night – I have pretty much an unlimited supply of power for my flashlights and my small electronics, and can switch to scrounging for AA batteries if I needed to. With the built-in lights of the battery charger pack and the newer USB battery, that makes four lights plus being able to charge my phone, iPad, and Kindle. If you don’t need to charge a phone, etc and you just want to cover flashlights only, just get the Goal Zero Guide 10 system and choose AA flashlights with a set of good batteries. You’ll have a down-and-dirty, simple power system that makes sure that you always have light. Now if you’re a tinkerer like I am, I’ve found a simple circuit that you can make out of common parts that will increase the voltage of batteries to the point that you could run a flashlight with batteries that would be considered dead. Check out the Joule Thief circuit article I wrote. There are less expensive ways to set this up but stepping up just a bit gives you much more reliable stuff. Cheap electronics has a habit of failing, just like I experienced in the Bahamas. Thanks for stopping in Alan. I hope you find more articles here that interest you. About the Kindle Paperwhite: That particular model only has 1.25GB of internal storage. Anything more than that uses the Amazon grid servers, which may or may not be down in a crisis. Likely down. I got a Barnes and Noble Nook Simple Touch black and white which has a micro SD slot for practically unlimited space. I have five 32GB micro SD cards for ALL of my data. I then rooted it so it would act like a full-blown Android 2.1 tablet. Installed some older apps that worked with that and ta-dah, now I have a power-sipping tablet. Battery lasts for weeks. Downside of this is you should be geeky before you try it — lots of frustration getting it right. But now that it’s working well, it’ll stand on its head and wag its tail. Good stuff. I’ll have to check it out. Great write up! I’m thinking about changing my tune based on this, I’ve been packing alkalines instead of rechargables. NIMH batteries (the one with the best capacity) have a tendency to discharge while not connected to anything and like a car battery, when they go dead, they aren’t as good anymore. But you bring up a good point, in an emergency, having virtually unlimited spares in rechargable batteries has its merits. Limefuel has a new rugged 15000 MAH pack out now, no light, but more trail friendly than the 24000 MAH tower of power. I thought I saw a comment about a special type of terminals added to electronics? I think there was a side-bar about Amateur radio going on at the same time. Trying to do some research on those power terminal types. A lot of ham radio guys are going with the Anderson Powerpoles as do some train and RC enthusiasts. I have everything I can find AA and AAA then I bought a bunch of the aaa to aa converters. Their cheap weight virtually nothing. you drop a aaa in and you get a AA battery. This way you have flexibility. For folks on a budget but some solar lights at Walmart that take 2 aa and you know if SHTF you can make 2 aa per day for a $5 solar light And it comes with 2 batteries to boot…. I prefer a solar recharger but it does take up a lot of space. Any updates on the Goal Zero? Still in good working condition? The goal zero is a solid system. I’ve moved up to a hodge-podge of larger systems now but that’s because I actually use all this stuff all the time to be able to work on the road while I camp or whatever and carry it mainly on my Harley. If they’re having that big of a sale, I’d probably jump on it. you a shout out from Austin Tx! Just wanted to tell you keep up the fantastic job! I love austin! Great music bars and great beef jerky there. We took a field trip there when I was deployed to Afghanistan the last time. Awesome town. It looks like the Goal Zero Guide 10 charger, is essentially just a rechargeable battery pack with replaceable batteries, i.e. you can use solar to charge the batteries in the pack, and also use the pack to charge your devices. So I’m wondering why the need for both the Goal Zero, and a separate Battery pack like the Limefuel. Sure the 2700maAh batteries only give you a 10800mAh pack, but with replaceable batteries I would think that would make that a non-issue. Does the GoalZero not allow you to charge the pack from solar and charge a connected USB device at the same time? Once you pull out the batteries to use them in something, that pack now is no longer a battery pack that can be used, and four AA’s don’t give enough power to really last very long. I’ve rarely used the battery pack as a battery itself. You can’t charge and use at the same time if I remember correctly. how well does the usb battery charge the goal zero? thought about trying a self contained solar charging battery pack with the goal zero charger and cutting out the solar panel. On amazon nowadays they have usb batteries that have an integrated solar panel. My gut tells me that I am giving up quality somehow by going this route, so I’m wondering if you have any experience with them. Some have 13k+ reviews averaging 4.5 stars and are rated at 20k+ mAh. The idea of cutting out the solar panel is attractive.